I made this cute little skirt for my toddler to wear! She loves to wear frilly skirts and dresses! It didn't take me long to made this adorable skirt and it was fun to make. Enjoy this pattern! Ribbon, any kind is fine, as long as it fits in the triple crochet belt space or chain a bow around the waist. Directions are for size 2 and 4, if you want a smaller size, then use less chains for the waist. Use your measuring tape to measure. (Chain 66 for size 2, or 72 for size 4), join to first ch to form a loop. Be careful not to twist it. 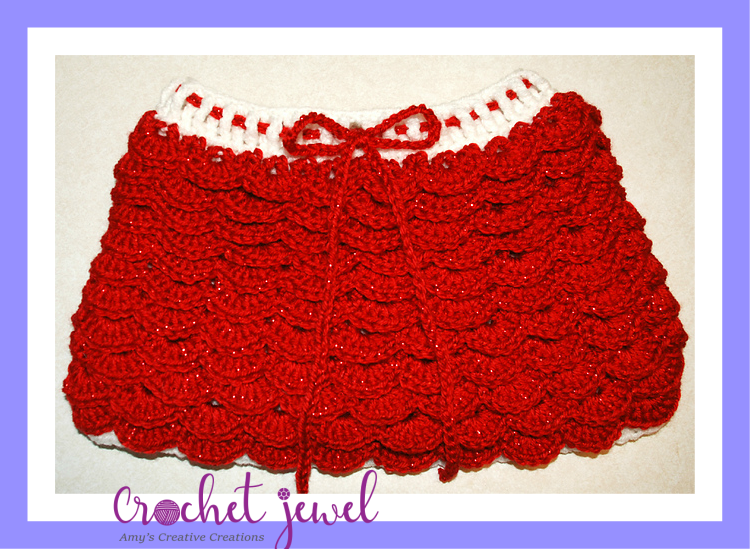 Take Ribbon and skip one triple crochet and insert in the next loop, *Repeat around, then in the center front, opposite side of the seam, Create a bow, or Chain 150 with a H hook, Repeat the directions for the ribbon for a bow. Ruffles: With the Red yarn, use a H hook. or you can use an larger hook for a larger ruffle. You can skip every other round with making a larger ruffle or do ruffles in each round. I did ruffles in each round, for a total of 12 rounds. Rnd 1. sl st with the red yarn, chain 3, dc in the back loop of the previous Rnd 1., (that will be your first v-stitch made) skip a back loop, and dc, chain 1, dc in the next back loop, (next v-stitch is made), *skip next back loop, dc, chain 1, dc in the next back loop, Repeat around. sl st in the beginning v-stitch. Now to incorporate the Ruffles, In the first v-stitch from Rnd 1 (continue on without fastening off), chain 2 (counts as first dc), then work 5 dc in the chain 1 space of the v-stitch, (that will be your first Ruffle), sc in the next chain 1 of the next v-stitch, *work 6 dc in the next chain 1 space of the next v-stitch, sc in the next chain 1 space of the next v-stitch, *Repeat around, a the end you may finish with a ruffle rather than a sc, then sc in between the last ruffle and beginning ruffle to create a sc space between those two ruffles, then sl st in the beginning dc of the beginning ruffle. Rnds 2-12. Repeat round 1. Begin with a sl st in the next round of back loops to start and then continue with how do the ruffles the same way as Round 1.